The Math Mastery program is designed to give students an introduction to their upcoming mathematics course. Previewing a course will build the student’s confidence, which will result in less frustration and better grades. 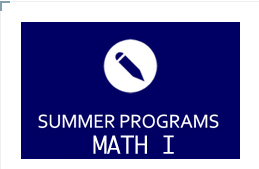 In Level 1, the student will be introduced to: integers; laws of exponents; rational and irrational numbers; ratios, proportions and percent; operations with polynomials; solving linear equations; applications of linear equations; and the equation of a line. In Level 2, the student will be introduced to: solving linear systems; applications of linear systems; factoring techniques; solving quadratic equations; analysis of quadratic equations; analytic geometry; and trigonometry. In Level 3, the student will be introduced to: advanced exponent rules; exponential equations; operations with rational expressions; complex numbers; quadratic equations; introductory optimization applications; functions; transformations of functions; trigonometric functions; trigonometric identities; trigonometric equations; and arithmetic/geometric sequences and series. In Level 4, the student will be introduced to: polynomial functions; advanced trigonometry; composition of functions; algebra of functions; and logarithmic and exponential functions.